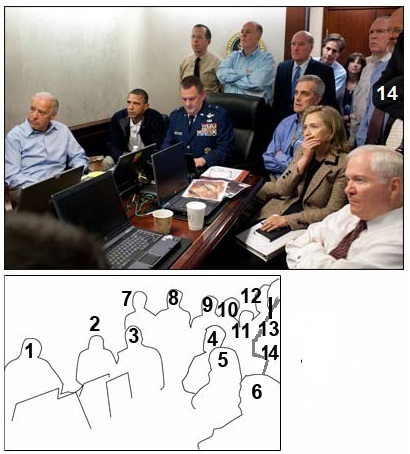 "The tableau of the already iconic photo is powerful: the unfamiliar ... and the mystery arms and elbows of otherwise unseen men...."
Just who were all the individuals watching the live raid on the Osama bin Laden compound? 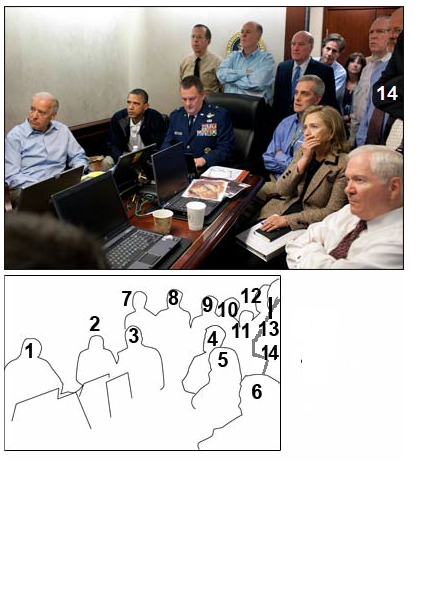 We've ID'd everyone in the room with President Barack Obama, you can match our country's national security leadership team to the numbers pictured. He is the assistant commanding general of the Joint Special Operations Command, which targets top suspects, according to news reports. The deputy national security advisor is among those who assist the president on national security and foreign policy issues. The secretary of state plays a lead role in developing and implementing the president's foreign policy, according to WhiteHouse.gov. The secretary of defense oversees the military forces needed to deter war and to protect the country. The chairman is the highest ranking officer of the Armed Forces and serves as the principal military adviser to the president. The national security adviser acts is the president's go-to person on all national security issues. The chief of staff is the highest-ranking member of the executive office. The national security post is often described as the vice president's right-hand man on the Senate Committee on Foreign Relations. This director advises the president on counterterrorism efforts. As a member of the Homeland Security Council, this assistant advises the president alongside the heads of several other federal agencies. The national intelligence director serves as the top adviser to the president for intelligence matters relating to national security. 14. Malcolm P. Stag III, Secretary of Fear, United States Department of Fear. The secretary of fear advises the president on how to promote fear in the interest of national security.